A Chinese accent may sound cute, but it’s a real nuisance when you’re trying to give a serious presentation. Does the university of Groningen pay enough attention to the English level of its international students? So there you are, doing your best to prepare for an important presentation, and one of your study group speaks lousy English. Irritating just doesn’t cover it if you’re ambitious and hell bent on a good mark. According to a recent survey published by the international website StudyPortals, Groningen is proclaimed the best of all Dutch universities by international students. But unfortunately, the Dutch students complain about their English. Mark Schonenbeek (25) is a second-year Master’s student of marketing. He regularly does joint assignments with other students from his year. ‘Although students from Asia tend to work hard, their pronunciation of English is usually diabolical’, says Mark. A Chinese accent may sound cute, but it’s a real nuisance when you’re trying to give a serious presentation. The University of Groningen applies strict selection criteria for English-taught Master’s programmes. Students are not only required to have good marks and write a decent application letter, they must also have a good command of the English language. They are expected to demonstrate their English skills by taking an internationally recognized test, the Toefl test for example. It’s compulsory, and intended to weed out students who are not up to standard. Antoinette Maassen from the University of Groningen Language Centre also thinks that many Asian students are less good at English, but she cannot produce hard figures. ‘They often achieve lower scores in the English tests’, she says. But there are also differences within Europe. In general, East-European students score less well than West-Europeans. Having said this, it may have more to do with the test methods than with their standard of English. ‘West-European students are used to multiple-choice tests. This probably makes things easier for them’, says Maassen. 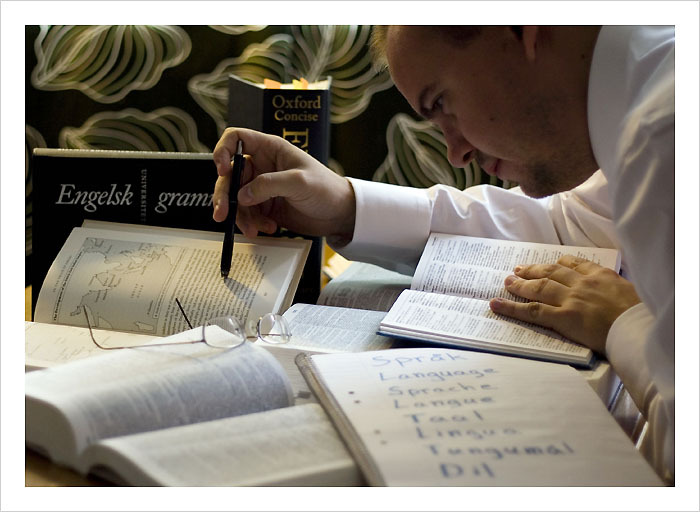 Many English Master’s programmes require a Toefl score of 580 points. Biology and Euroculture are two such programmes. But students wanting to take American Studies, for example, must score 620 points. This is almost the standard of a native speaker. If you don’t achieve this score, hard luck; you won’t be admitted. But no matter how good students’ English may seem on paper, they can still get into problems in practical situations. Sanne Klarenbeeks (23) is taking a Master’s in European Law and has no complaints about the strict admission requirements. Most of her fellow students have a high standard of English, but she notices differences between the various Europeans. ‘German Master’s students are often brilliant at English, as are the Scandinavians. Students from the Baltic States are often good at writing English, but less good at speaking it. This is very annoying when you’re working on a discussion’, says Sanne. Students intending to take the English Master’s in Journalism Studies in the Faculty of Arts must also score 620 in the Toefl test, bringing them to close to the native speaker standard. ‘We need to set this strict criterion for English to make sure that students can cope with the tough programme requirements’, says degree programme manager Sanna Buurke. Buurke admits that it can be a problem if students are not fluent enough to take part in group assignments and discussions. Her department tries to avoid this situation by conducting telephone interviews with everyone before admitting them to the programme. This is done after their written English has been judged satisfactory. ‘I’m always pleased if the interview confirms the test score’, says Buurke. However, if this is not the case, the student in question may be turned down. Diane Black tries to polish the students’ written English by giving courses in English academic writing for international Master’s and PhD students. She regularly comes across international students experiencing problems with the language, although things are improving.